Babel was a three day art event by artist Chris Minchin, taking place in Holy Trinity Church, Jesmond. The exhibition placed potentially controversial artworks in a church in order to open a dialogue. It included a projected animation of a boy writhing in an ambiguous blank space. Taking imagery from a video of a teenager having an exorcism performed on him, it presents the boy as a universal figure challenging the Church to reflect on grace and love at a turbulent point in its history. The centrepiece was a sculpture made from the fabric of a functioning church, using the church chairs to build a 20ft temporary tower in the nave; it evoked the tower of Babel as a symbol of transformation to consider the nature of Church in modern society. Installed alongside were photographs of a World War II labour camp in Krakow, Poland, that was later to become a set for the film Schindler’s List. It documents a place caught between reality and unreality as a setting for stories of death and life slowly disappearing under foliage and water. 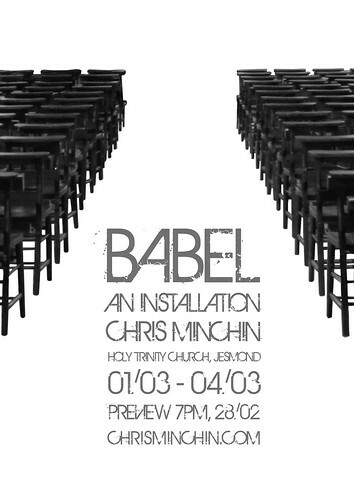 February 10, 2011 | Filed under Uncategorized and tagged with animation, art, artist, babel, chairs, chris minchin, christopher, church, exhibition, holy trinity, installation, jesmond, liban quarry, newcastle, tower.